Given that, here are my armchair comparisons of India and China in a few areas and more specifically Hyderabad (population approximately 4 million and Beijing (population approximately 12 million (metro) , which are the two major cities I visited in the last 10 months (in previous trips, I’ve been to Mumbai and New Delhi which would be a better comparison in terms of population, but didn’t go to either of those cities this last trip). This only considers these two cities, as I know, particularly in China, Beijing isn’t necessarily a representation of the rest of China. 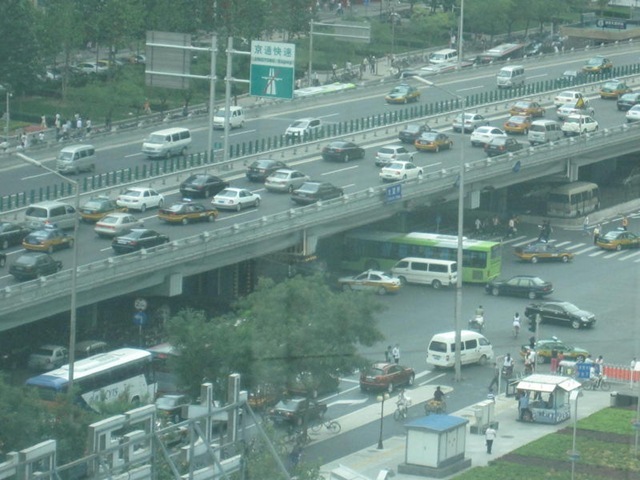 The major streets and highways of Beijing felt more organized than in Hyderabad. Traffic was more orderly, people walked on sidewalks and crossed the street at designated crosswalks, signs on the highway stressed to drivers to stay suitable distance from the car in front of them, and left turns made by vehicles were done when the opportunity arose. In Hyderabad, it felt like there were more people walking on the streets, more types of vehicles including auto rickshaws and motorcycles, and not as many sidewalks and crosswalks leading to pedestrians more frequently being intermingled with the auto traffic. Of course, the types of governments do play a role here—the Chinese government is more easily able to institute policies limiting the amount of cars on the road each day, for example. One thing I felt that when walking on the major, busy street of Hyderabad vs Beijing, everything is louder in India. You have the constant sound of horns honking, vendors, policemen, and pedestrians yelling, construction crews all about with sounds like jack-hammers, and just more people outside. It seems like there are more people gathered at road-side shops during the day in Hyderabad than in Beijing and these people generally aren’t alone—generally someone with them to talk to. A wonderful part of the India experience is the sound—it’s loud and offers a real sense of vibrancy. 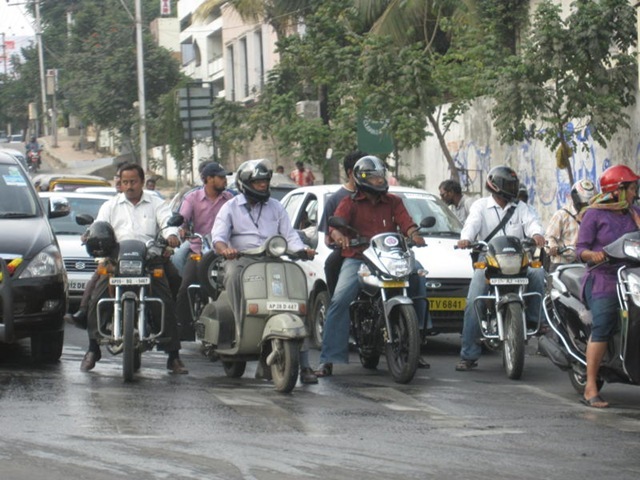 When looking at the vehicles on the major roads, in Hyderabad, you will see a lot more motorcycles and scooters on the road, leading to the sense of a more crowded road scene. Not sure if that is related to government policy that limits the number of vehicles, including motorcycles on the roads each day in Beijing, or an indication of different economic stages in India than in China, where there is an intermediate step between the more expensive car ownership and the less expensive options of public transportation such as bus transport. Likewise, you don’t see the auto rickshaw transportation option in Beijing. You do indeed see the taxi option, but in Hyderabad you will see the taxi option (more expensive than the auto rickshaw) and the auto rickshaw option. In Beijing, it felt like there were more German and Japanese brand automobiles than any other type. Didn’t see many domestic Chinese brands or American brand vehicles. In Hyderabad, the mix felt much more distributed amongst American, Indian, Japanese, and German brands, with German brands at a much lower proportion in Hyderabad than in Beijing. The Beijing airport is world class, comparable to any airport in Europe or the US. The new airport in Hyderabad is also a big step forward for an Indian airport, getting into the world class category, but perhaps a smidge below the level of the Beijing airport. Of course, with the Olympics, the Beijing airport was prioritized at such a high pedestal to welcome the world that I would imagine it is a rung above all other Chinese airports. When walking around the major streets, it appeared that more Chinese in Beijing were wearing western brand name clothing and were more fashion oriented than I saw in Hyderabad. Certainly in Hyderabad, there is a segment that is very fashion focused, but it felt more so in Beijing. Again, Beijing may be an anomaly compared to the rest of China. A big fan of pizza, I tried pizza in both Hyderabad and Beijing. I preferred the pizza of India. There was an attempt to be a little more unique and bring a bit of local flair to the sauce in India than in Beijing. In Beijing, the pizza was made to as closely match the western pizza formula, and while it was a good attempt, it didn’t match up to the western pizza I’m used to. When eating the Indian pizza, I didn’t find myself looking to compare to western pizza as much as it had some of the local feel to it. I went to an Indian restaurant in Beijing and enjoyed Indian food. It was quite good—would recommend it to others. I found that the Indian food and the menu offered didn’t have fusion type Indian-Chinese dishes—they were Indian dishes, without the addition of Chinese flavors and spices. In India, it feels like every other block has an Indian-Chinese restaurant or menu, where the Indian dishes have clearly been integrated with Chinese dishes and flavors. A very prevalent trend in India over the last few years. When driving outside of Beijing and Hyderabad to smaller towns and suburbs, I noticed many more statues and pictures of historical and current leaders outside of Hyderabad vs Beijing. I’ve had this impression that in Communist countries, you’d see many more statues of leaders there but in India but was not the case. My guess is in India, the way politics and government life has been pitched and glamorized over decades, the adulation of leaders, or the pushing of a supposed adulation, may be more publicly displayed. In Hyderabad, I saw the aftermath of an accident between a motorcycle and a small car and in Beijing I saw the aftermath of a collision between a bicyclist and a pedestrian. Fortunately, no one was injured in each of these situations. Both of these accidents occurred in busy streets with many people around. In Hyderabad, the motorcycle driver and driver of the automobile immediately began yelling at each other and a crowd of people joined in and basically sided with the motorcycle driver and jointly began a verbal confrontation with the driver. There wasn’t an attempt to disperse and stay uninvolved after it was clear that there was no injury. In Beijing, the crowd went to see if the woman was ok, while the bicyclist just rode off—no verbal confrontation occurred. In India, I think the crowd would have surrounded the scene immediately and a verbal discussion would have occurred before anyone could have left. It felt like there were many more American and European ex-pats in Beijing than in Hyderabad. This may be because I was on a business trip to Beijing and a personal trip to Hyderabad so I was much more likely to see business ex-pats, but in general, I do believe that to be the case. I feel part of that may be that more American companies have sent back Indians from the US back to their home country to play key operational roles in India than the number of Chinese in American multi-national companies that have gone back to lead operational roles in the Chinese divisions. Around the parts of Beijing I saw, you don’t see much of the slums and other housing for the very poor that you see in Hyderabad. Again, potentially, the nature of the government in Beijing can control this through policy much more than in India. I learned from the news on, The Shanghai World Expo will be very busy, May 20 I’m going to. China tourism will definitely very hot, there is traveling to China friend? if you actually looked you’d notice the extremely large and many housing towers in china. china has no slums, or at least only very very few. I’ve been to the countryside and am amazed by the fact there doesn’t seem to be any low squatter homes. the government provides housing in very large skyscrapers, especially in shanghai area. also, india has significantly more poor people than china. just look at the gdp per capita. As to the airport in beijing, it’s much better than any airport here in the US, including LAX, Newark, Chicago, JFK. It was literally jaw dropping to me. Phicardo– thanks for your comment and visiting the site. I certainly don’t know enough about China. My only visit has been to Beijing for a week on a business trip. I would certainly like to spend more time, and visit many more parts of China. What are the key similarities and differences you’ve seen in Hyderabad compared to the parts of China you were living in? apurvadesai- that’s sure many differences and similarities i have seen,but i didn’t visit many parts of India either,so i can not say i know india well.Just talking something in my opinion. There’s no doubt that Indian is a great country in the world,but what i have seen in Hyderabad as what i had seen in China ten years ago,no offense here,i mean there are many opportunities for your people nowadays,because a lot of space are there for India to develope, but i think in China,for each person,the space is much less now. And the key similarity,i believe is that both Indian people and Chinese people are quite friendly,but maybe because of some historical reasons and cultural causes,many misunderstandings are between Indian and China. And the key difference,i think is that Indian is keeping their traditional way of life,but in China many things tend to be like westerniztion,i can not say which is better,time will tell all the things, but i think it’s very important to protect our own traditional. Thanks for giving me the chance to express,and i hope there are some more forums for the two country’s people to communicate, the more we communicate the less misunderstanding we would get,and the better relationship we will be in.